Another part of history has been revised today by Polish ski champion Andrzej Bargiel. He became the first man in the world to successfully ski down from summit of Broad Peak which is 12th highest mountain in the world. He started ascend from camp 3 on 3 am Pakistani time and reached summit at 11 am. 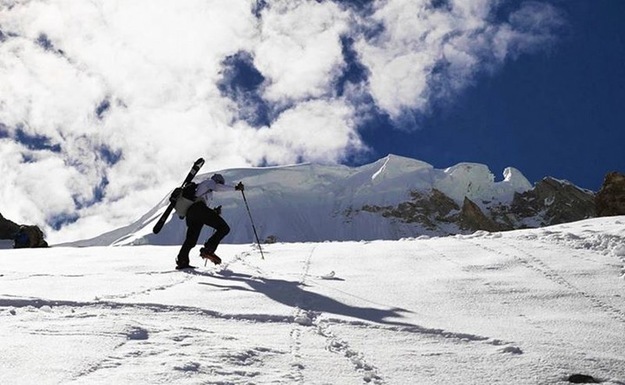 All other teams returned due to horrible snow conditions and high altitude winds, Andrzej also become the only man to reach summit of Broad Peak this year. He skied down from summit, on descent he took at short break in camp 3 and then carried on to base camp. Andrzej carrying skis to Camp 3. Andrzej in 2014 climbed Manaslu 8th highest mountain in the world in record time of 14 hours and 5 minutes. He then completed descent of 8000er in 7 hours, time of ascent and descent was recorded to be 21 hours and 14 minutes. Andrzej set a speed record in race to Elbrus in 2010 and record is still unbeaten.